Note: This article has been revised to reflect updated election results. 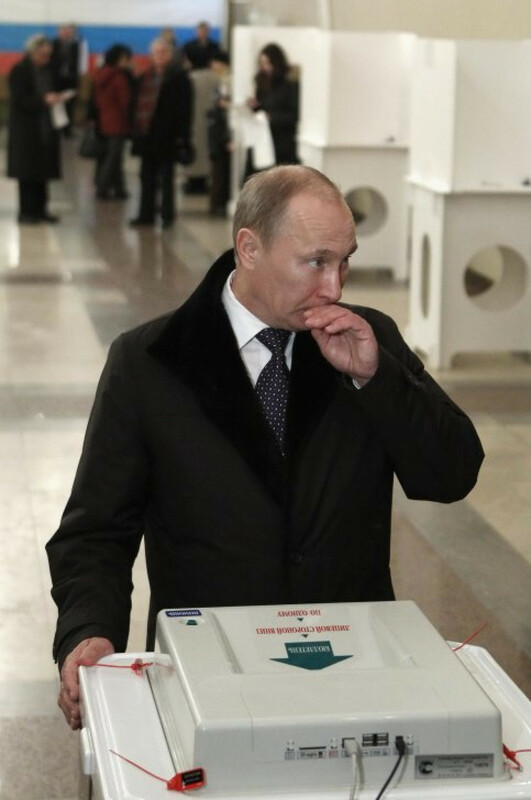 Poll results gave United Russia slightly less than 50 percent of the vote by Monday morning after State Duma elections that took place amid an unprecedented series of detentions, threats and attacks against the independent media, election observers and opposition activists. With 95 percent of ballots counted, the ruling party had garnered 49.5 percent, the Central Elections Commission said on its website. Yet the results already indicate that the party, which has crushingly dominated the country's politics for years, is on track to lose its two-thirds majority in the Duma. 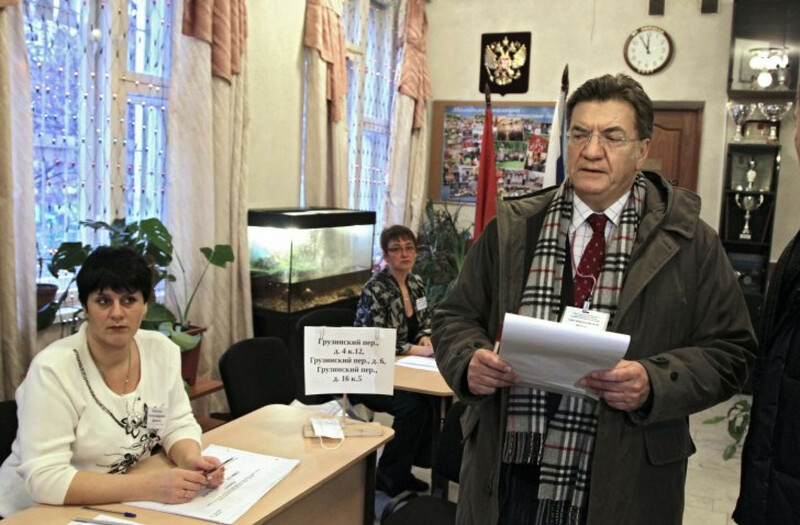 In the 2007 elections for State Duma, United Russia got 64 percent of the vote. On Monday morning, the Communist Party was placing second, with about 19.2 percent, up from 11.6 percent in 2007, the elections commission reported. 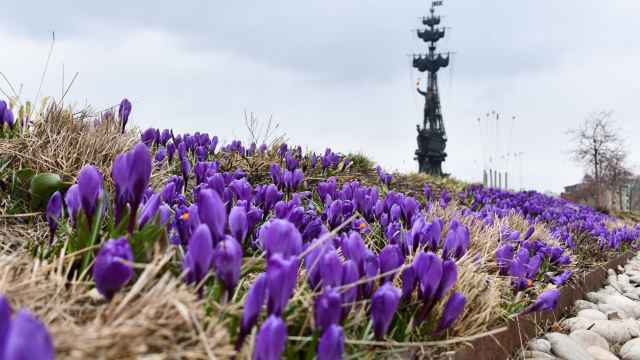 The Communists were followed by A Just Russia, with 13.2 percent (up from 7.7 percent), and the nationalist Liberal Democratic Party, with about 11.7 percent (up from 8.1 percent). No other parties cleared the 7 percent threshold. Voter turnout was 60.2 percent, according to the Central Election Commission's website. In 2007, it was 63.7 percent. It was unclear what a less than 50 percent showing for United Russia might mean for President Dmitry Medvedev, who led the party's ticket. Prime Minister Vladimir Putin, who is expected to return to the Kremlin in the presidential election next year, has said he would make Medvedev his prime minister if United Russia performed well Sunday. 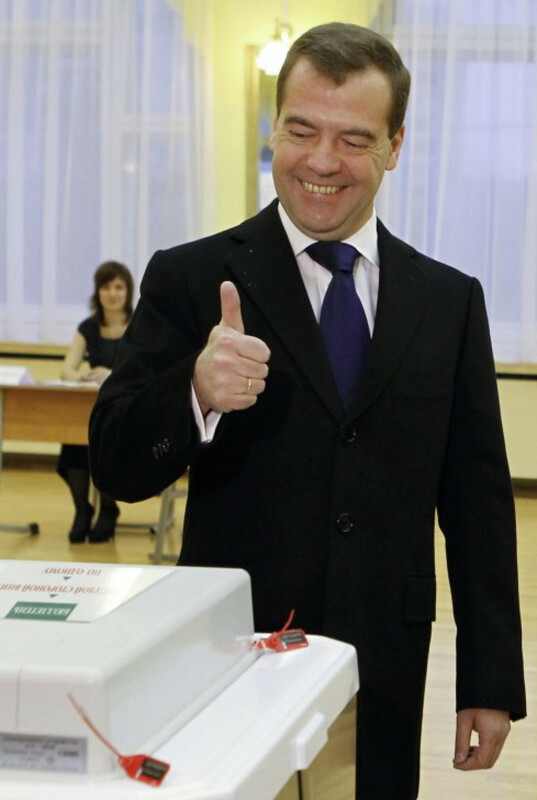 Speaking before the final results were announced, Medvedev praised United Russia's showing, saying at the party's campaign headquarters that they showed the party had a "moral right" to continue to pursue its pro-Kremlin course. "Based on this result, we can ensure the stable development of our state," Putin said, speaking at the same venue late Sunday night, Interfax reported. "Many thanks to everyone who contributed to this result." Election day kicked off with a series of denial-of- service attacks that brought down the web sites of major liberal media outlets, including the Ekho Moskvy radio, the Kommersant daily, the New Times weekly and the Slon.ru business news portal. LiveJournal, the country's most popular blogging platform, was also down for the first half of the day after suffering repeated attacks throughout the week. Not affected were liberal-leaning Gazeta.ru, Novaya Gazeta and online TV channel Dozhd. Nobody had claimed responsibility for the attacks as of late Sunday, but most commentators suspected hackers linked to United Russia. "It is obvious that the attack … is part of an attempt to prevent publishing information about violations," Ekho Moskvy editor-in-chief Alexei Venediktov wrote on Twitter. Ekho Moskvy's web site remained down throughout most of the day, but abruptly went back online immediately after 9 p.m., when voting closed. The radio station posted its publications on its Facebook page throughout the day, including a screenshot of its site full of "Bad Gateway" messages, which it jokingly called the "new site design." The station's radio broadcasting was unaffected. Cyberattacks also shut down the site of Golos, the country's only independent election observer, and Kartanarusheniy.ru, a map where its supporters can report violations from all over the country. Golos said its hotline was blocked Sunday by a flood of automatic calls. But it defied the shutdown of its monitoring web site by publishing hundreds of new violation reports on a Google Docs page. 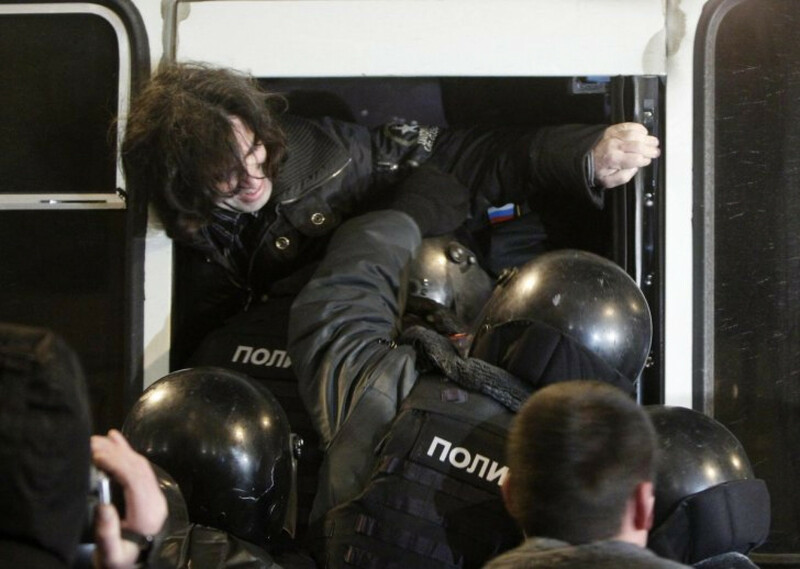 Prior to the vote, Golos was subjected to a combined onslaught by government-controlled media and law enforcement agencies, which implicitly accused the organization of treason by accepting Western financial grants. The watchdog's director, Lilia Shibanova, was detained at Moscow's Sheremetyevo Airport upon arrival from a conference in Warsaw on Friday night. She was released only after noon Saturday, when she agreed to hand over her laptop for inspection to customs officers. Earlier Friday, a Moscow court fined Golos 30,000 rubles ($1,000) for violating a law that prohibits publication of election opinion research for five days before a vote. The organization also reported that many of its activists were visited by law enforcement officers. The Golos affair triggered an unusually sharp reaction from the U.S. White House, which said in a statement that President Barack Obama's administration was proud of its support of Golos, which it said is intended to strengthen democracy, not influence elections. 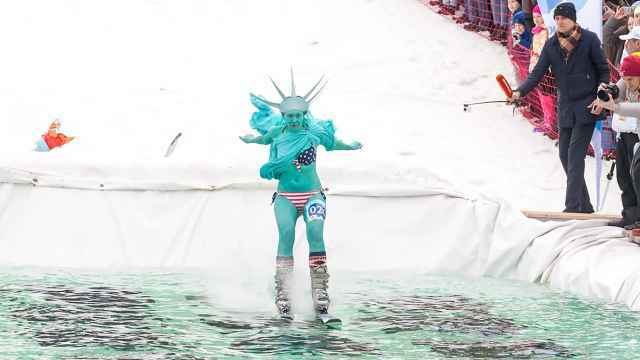 "The United States … will continue to support those citizens and nongovernmental organizations working for free and fair elections in Russia," the State Department said in a statement carried on the web site of the U.S. Embassy in Moscow. 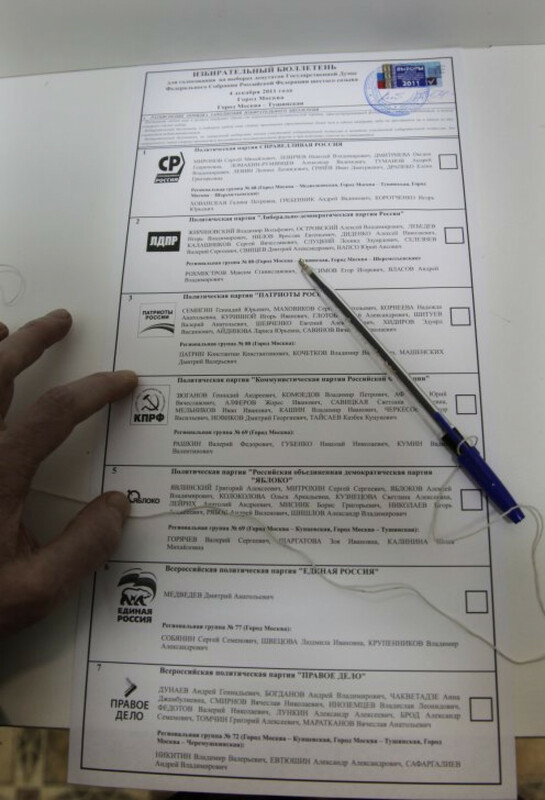 Also Sunday, the organization's twitter account @GOLOS_ORG faced competition from a fake account called @golos_org, which published exit polls for the Far East and Moscow, claiming that United Russia had won 58 and 51 percent, respectively. The fake account could add to Golos' legal troubles because it was illegal to publish polls before 9 p.m., when voting wound up in Kaliningrad. Golos' election monitoring site was run together with Gazeta.ru, but the news web site removed the link last week. Gazeta.ru editor Mikhail Kotov was summoned by the Federal Mass Media Inspection Service on Sunday, where he was told that election chief Churov and Deputy Prosecutor General Alexander Buksman had complained that the portal had violated the law. Churov said the violations mentioned on the web site "aren't violations but agitation" against United Russia, Kotov told Interfax. 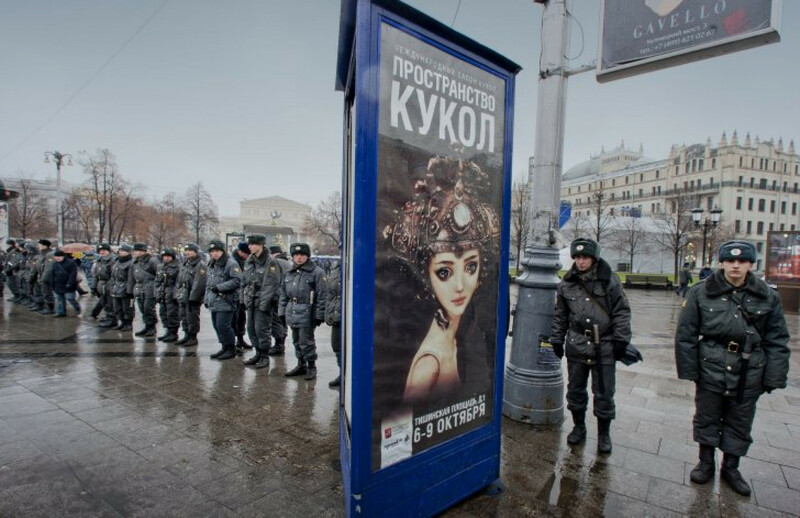 He added that a court would decide later on whether to punish Gazeta.ru. Meanwhile, Churov made some trademark eccentric remarks Sunday, when he praised a ballot box made of a pryanik, or gingerbread. 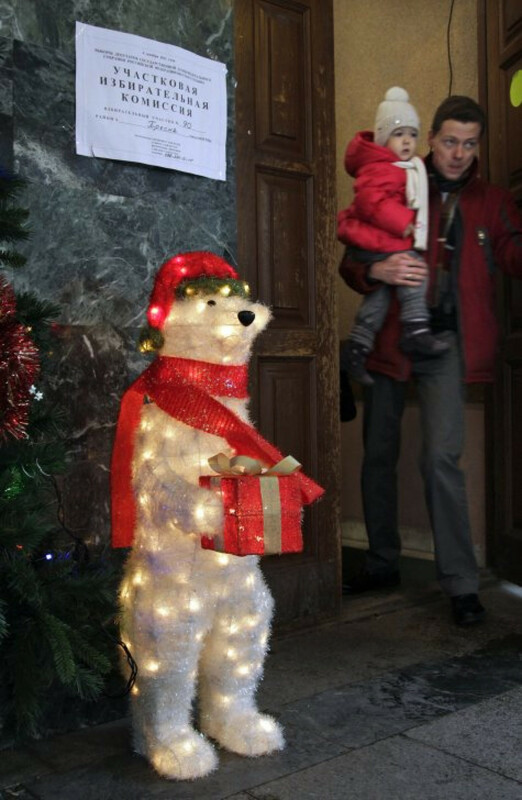 "This is clearly a souvenir, but in an emergency it can be used and eaten — without the ballots, of course," he told reporters in Tula, Interfax reported. During a tour of the region south of Moscow, famous for its pryaniki, Churov, who was accompanied by election observers from Bolivia, also visited a circus troupe, whose premises served as a voting station. Among multiple indicators of violations Sunday were YouTube videos showing what appeared to be United Russia activists campaigning outside polling stations in violation of election laws and reports of attempts to buy votes. 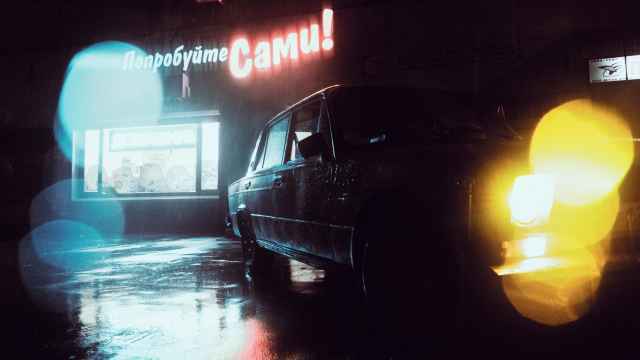 One incident, reported by the government newspaper Rossiiskaya Gazeta, said young men in Yekaterinburg were paying voters cognac and pork to vote for a certain unidentified party. In St. Petersburg, a young man was detained carrying a rucksack full of fake voter registrations, Dozhd online television reported. 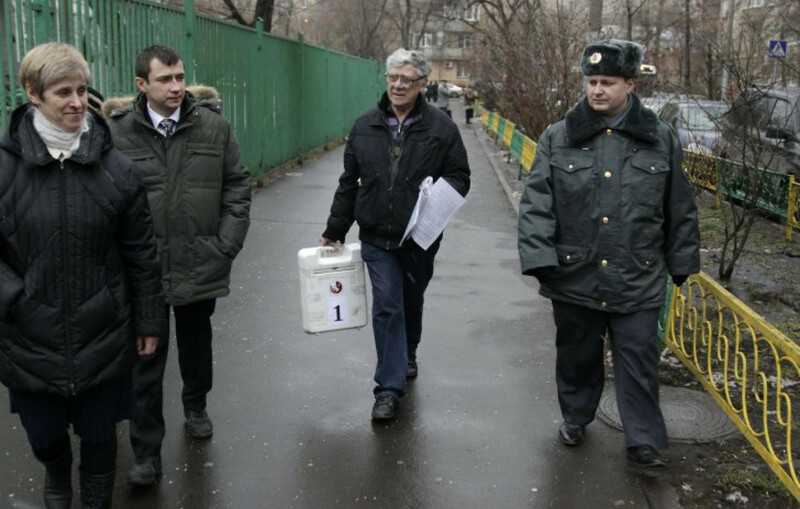 Golos, meanwhile, reported that many of its election observers where barred from entering polling stations. 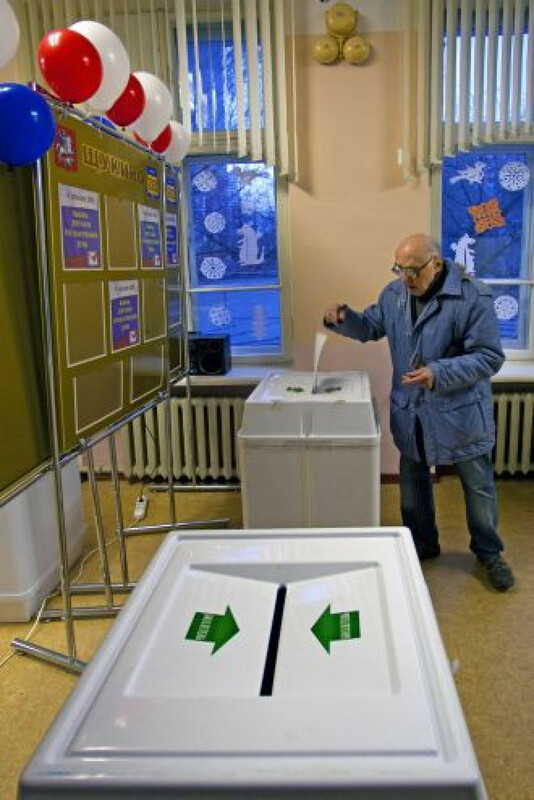 The elections were also monitored by more than 650 foreign observers, half of them from the Council of Europe and the Organization for Security and Cooperation in Europe, or OSCE, who are to present a report on Monday. Another opposition figure, Left Front leader Sergei Udaltsov, was hustled by unidentified men into an unmarked Mitsubishi and driven away. The Tverskoi District Court later sentenced him to five days arrest for "disobedience," Interfax reported. 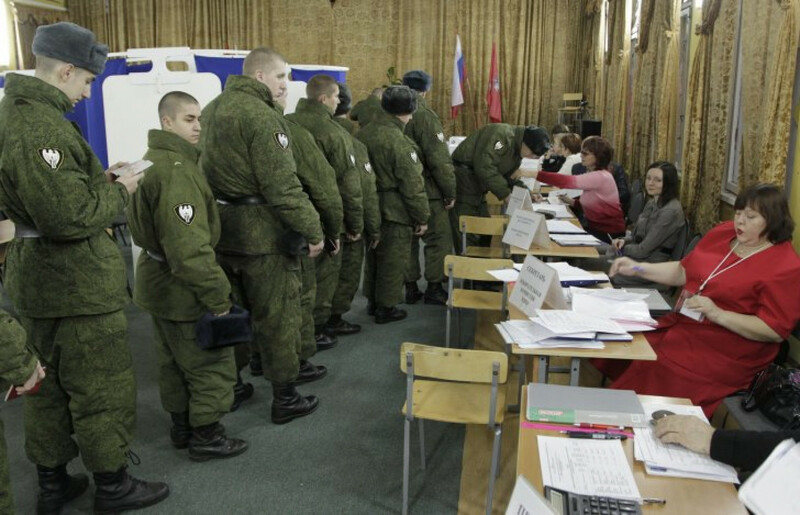 In Moscow, police detained a BBC cameraman after filming at a Moscow polling station. 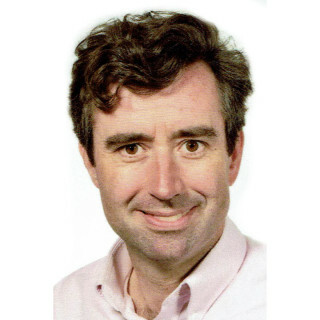 He was released after an hour with an apology, but only after officers had viewed his footage, BBC correspondent Daniel Sandford wrote on Twitter. Election commission officials confiscated the accreditations of Radio Liberty reporters Vitaly Kamyshev and Danila Galperovich, the U.S. Congress-financed outlet said on its web site. 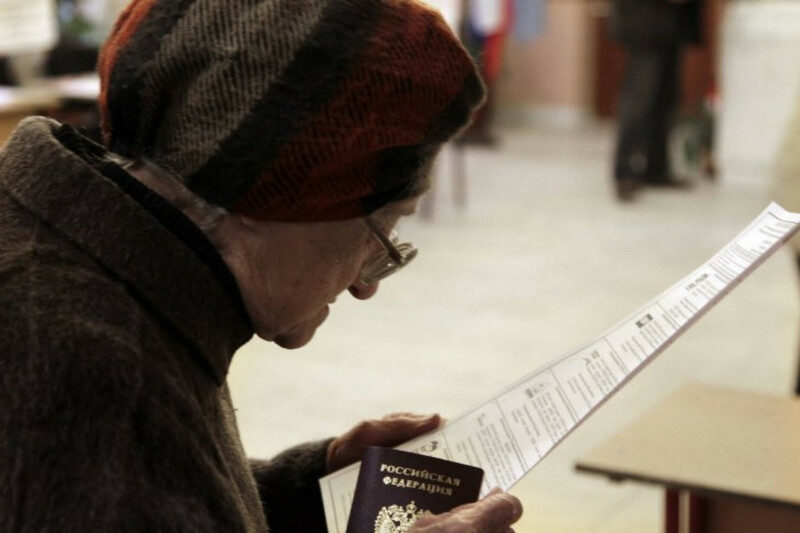 Voters also cast their ballots in the Georgian breakaway regions of Abkhazia and South Ossetia, where most residents have Russian citizenship. In South Ossetia, where the situation is tense after the region's top court nixed a presidential election that was won by opposition candidate Alla Dzhioyeva, her Moscow-backed rival Anatoly Bibilov voted in the Russian consulate in the regional capital, Tskhinvali, Interfax reported. 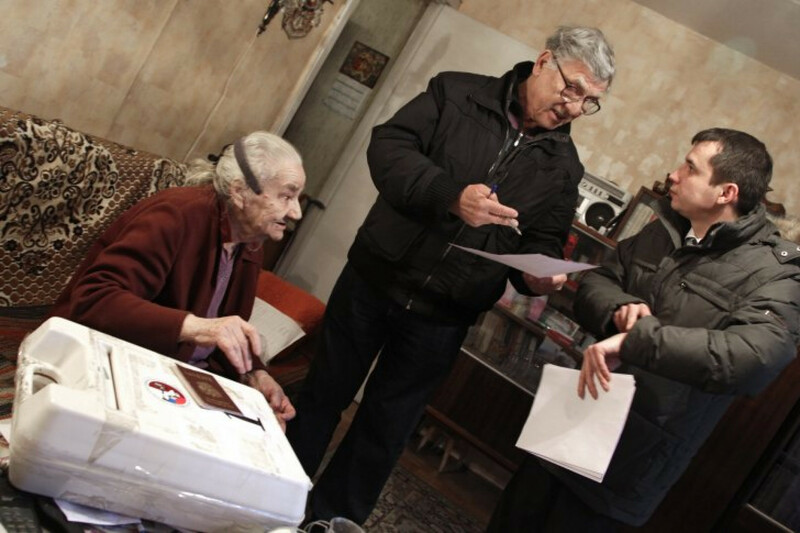 At many polling stations in Abkhazia, turnout was so high that voters had to wait in line to get to the ballot boxes, Interfax reported. The region's president, Alexander Ankvab, voted together with Russian Ambassador Semyon Grigoryev in a Sukhumi school, the report said.